MiMo Archival Mounted™ Prints are an ideal addition to an artist's or photographer's product range. alongside Greetings Cards, Postcards or Larger Giclée Prints. making them ideal for the gift market, selling at craft fairs, art markets and in shops. printed on 270gsm Fine Art Watercolour texture paper and will be colour-fast for around 75+ years. 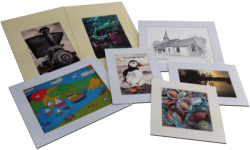 These make an ideal gift or souvenir of your art or photo. MiMo Archival Mounted™ Prints - Produced on acid-free, archival papers in-house. Colour-fast for around 75+ years.